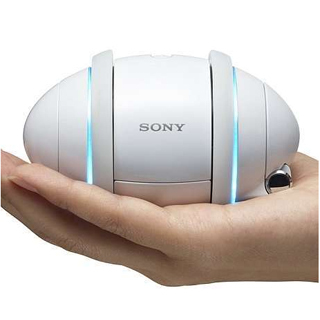 Sony has introduced the Rolly, an egg-shaped robotic “audio entertainment player”. The Rolly plays MP3s from speakers on each end that are normally hidden by dish-like covers. The device has just one button, an on-off switch. Everthing else is controlled b y a pair of rings that circle the player’s body. One ring is used to move from track to track or album to album while the other controls the volume. If that’s not strange enough for you, the same two rings are connected to motors that enable the Rolly to scoot around a table-top in time to the music being played. Rolly has 1G byte of flash memory built-in and can playback MP3, Atrac or AAC songs (AAC songs with copy protection from iTunes Music Store aren’t supported). In addition to playing back music from its internal memory the Rolly can also receive music streamed via a Bluetooth connection. We’re not sure who this MP3 player is designed for, but it may be Phillip Torrone and the rest of the hackers at Make Magazine. Rolly’s movements can be programmed into the device for each track. There are six basic movements that the Rolly can be programmed to do, like moving its speaker covers in or out or turning the wheels. By sequencing the basic movements, complex moves are possible. Sony will supply an app called “Motion Editor” to get you started. Sony also plans to launch an online community where the company and users can share movement files. Users should get about five hours of audio playback from Rolly. This drops to four hours when the device is in motion and three and a half hours when Bluetooth streaming is also enabled. No word yet on whether you’ll be able to remotely control it’s robotic brain.